Are you attracted by bonsaï? Do you feel any interest about those littlre trees? Are you simply curious? You should maybe think about becoming a member of our society! Doing so, you would have many advantage, learn more about that passion and meet wonderful person! Acces to all the archive of the Larix, the society journal. 10% discount at the Nursery Bonsaï Gros-Bec. 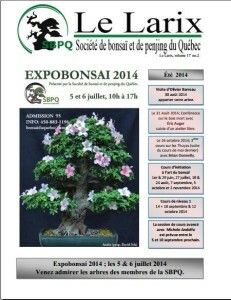 Free acces to the annual SBPQ exhibition, to present your trees or to visit. Acces to all activities, formations and courses offered by the society. Acces to the Andolfo Bonsaï Studio, the high level courses offered by the SBPQ. To be the first to hear about new trees arrival from Asia, Unated-States or British Colombia. Have acces to precious advices from senior members of the society to guide you and help you progress into bonsaï. An unlimited support from the pépinière Bonsaï Gros-Bec for everything related with your trees, their winter keeping, pour tout ce qui concerne vos arbres, gardiennage en hiver, phytosanitary treatments, professionnal opinion, shaping, spécific matérial, etc. Have acces to many documentation on this site through the special “member acces”. Meat people, build strong link, becoming a real Bonsaïka! * 35$ is the individual membership, it is also possible to get a family membership for 45$, so the same advantages for you, your partner and children under 18 years old! You have some questions, do not hesitate to contact us! After havinf fil out this form, we will contact you as soon as possible. You will have to send us a check of 35$ (or 45$ for family membership) to the SBPQ. This check will have to be send by mail to our head office. Remplissez le formulaire ci-bas pour adhérer à notre organisation. Êtes-vous membre d'une autre organisation de Bonsaïste ?